Loving you, Loving me, Companion Animals and Domestic Violence is collaborative project that highlights the personal experiences of women who have survived domestic violence. Flinders University researchers Dr Heather Fraser and Associate Professor Nik Taylor; Carley Millich and Julie Felus of Northern Domestic Violence Service NDVS; and Celine Graham of Relationships Australia South Australia have worked together on this project, which included individual interviews and a photo shoot with the survivors. The women were photographed by volunteers from the Mawson Lakes Photography Club with their children and pets. These beautiful photos were artistically shot to help de-identify the participants. Having these photos is particularly important for families who fled violence without being able to take their family photos. The photos will be exhibited along with excerpts from interviews Dr Fraser and Nik Taylor conducted with the women about their relationships with companion animals during and after leaving their homes. You are invited to help launch this exhibition on Friday 9th June at 11am at The Mawson Lakes Centre. Minister Zoe Bettison will officially launch the exhibition. Ms. Christine Craik, a social work academic from RMIT University in Melbourne will also be present to speak on her personal and professional experiences of domestic violence and animals. All are welcome to this free event. Join the Animals in Society Working Group, and the School of Social and Policy Studies at Flinders University, for a special presentation by renowned animal activist, photographer, and founder of the Unbound and We Animals projects, Jo-Anne McArthur. In her talk, Jo-Anne shares an array of photographs that look at the amazing and joyful work taking place worldwide to help animals and introduces both the activists and the animals she has met on her journey. The presentation is revealing, inspiring, motivating and aims to help us learn about some of the incredible women working to protect animals worldwide and to build empathy towards non-human animals. Jo-Anne has travelled the world as a presenter, undercover investigator, photographer, activist, and advocate. She was featured in the critcally acclaimed documentary “The Ghosts in Our Machine,” and has published two books, We Animals and the soon to be released Captive: the Book. 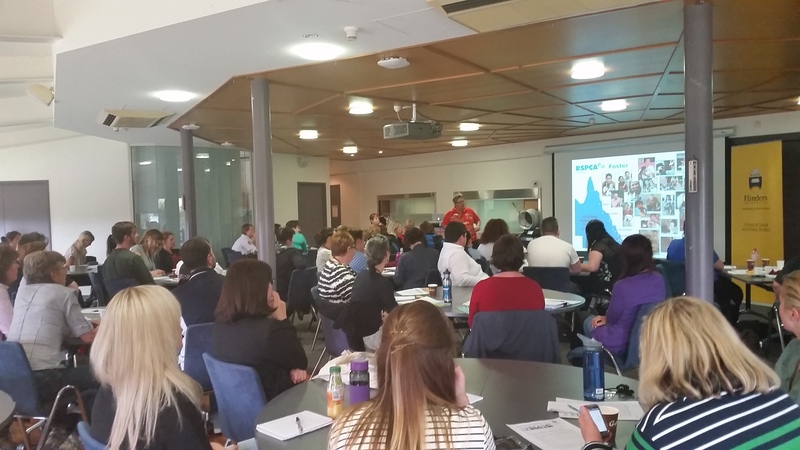 September 2014: Ninety people participated in the Animals in Society Working Group (AISWG) and Australian Centre for Community Services Research (ACCSR) workshop For the Love of Animals: Animals, Human Wellbeing and Community Services on Sept 30th 2014 (9-5pm). From the 41 people who returned evaluation forms the mean score out of 10 that participants gave for the day was 8.6. For more about the day see our events page. 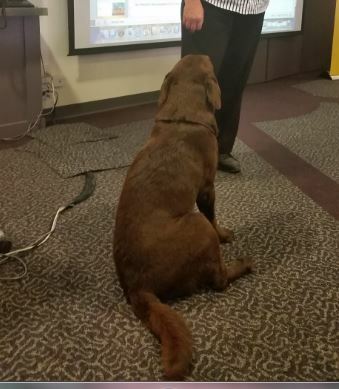 The workshop will bring together those researching human-animal relations in the community and community service practitioners who have an interest in how animals contribute to community health and well-being. Anyone interested in understanding more about how human-animal bonds can be recognised, valued and supported in a range of community services is welcome to attend. Where: Function Centre, Flinders University Campus, Bedford Park, Adelaide. PDF Map, here. Google maps, here. Registrations: $30 waged; $10 student/unwaged. Morning and afternoon tea and a buffet lunch will be provided. Jules is the current State Foster Care Coordinator for RSPCA Qld. She started with the RSPCA in 2010 and oversees the foster care program in 11 locations throughout the state. Her role includes the management of the Pets in Crisis Program, which provides temporary pet boarding for individuals escaping domestic violence. She also oversees the foster care programs at Brisbane Women’s Correctional Centre and Arthur Gorrie Correctional Centre in Brisbane. Prior to joining the RSPCA, Jules was the Military Working Dog Breeding Program Manager for the RAAF (2002-2010). She and her long-term partner, Rachel, own a Chihuahua called Versace (aka Kevin), more cats than is probably sensible and a 17yo son called Liam. Sally is the manager of the Victorian RSPCA Education Department. She spends her days ‘talking to the animals’ – all for work! – while she oversees an enthusiastic group of two and four legged educators. She says yes far too often, but loves the diversity of experience each and every project brings. Sally and her team engage with over 11,000 learners every year and they have identified a need for a multi pronged approach to program delivery. Sally will talk about the CARE program (Creating Animal Respect and Empathy) that targets children newly arrived to Australia, with a focus on refugees and asylum seekers with a history of trauma. Nik (Taylor) and Tania (Signal) have been working with the RSPCA team to assist with evaluating and measuring outcomes from this initiative, with astounding results. Linda is a Lecturer in the Department of Employment Relations and Human Resources at Griffith University. 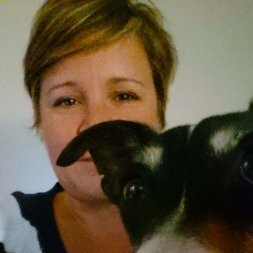 She will speak about her PhD, which was based on her ethnographic work as an animal shelter attendant in a large Australian animal welfare organisation. In her study, she focuses on emotion, power, and coping as central issues for both the employees and the animals involved. More information on Linda can be found on our Members page. 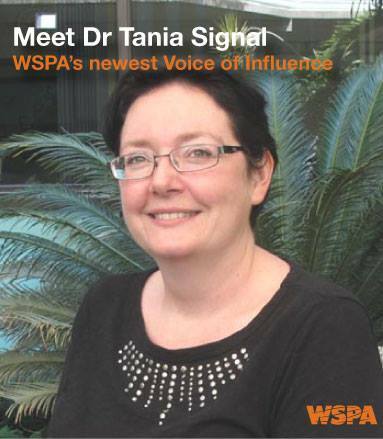 Tania is a Senior Lecturer in Psychology at CQUniversity. She will speak on her comprehensive research program broadly investigating Human-Animal Interaction covering topics such as potential links between personality factors (especially empathy), interpersonal violence and the treatment of animals. More information on Tania can be found on our Members page. Dr Susan Hazel is a veterinarian and Senior Lecturer in the School of Animal & Veterinary Sciences at the University of Adelaide. She teaches animal behaviour, welfare and ethics to Animal Science and Veterinary students and has won a teaching award for innovative teaching methods. Susan has an expanding group of Hons and PhD students working on projects aiming to improve our understanding of animals and their behaviour and improve the human-animal bond. Lydia is a veterinarian and veterinary pathologist who currently works at Taronga Zoo and the Sydney University Faculty of Veterinary Science. Lydia has a special interest in the pathology of animal abuse and the links between animal abuse and domestic violence. She will be talking about her current research into the links between animal and human violence where she is examining the frequency of pet abuse in violent homes in NSW, and whether victims of domestic violence utilize and trust veterinarians when their pets are injured by a violent partner. (Dr) Heather Fraser has been a social work academic for more than two decades, specialising in the area of violence and abuse related to women and children. In recent years, Heather’s interest in non human animals, particularly companion animals, has coincided with her (human) social work interests. Now it is a central part of her research agenda and practice concerns. Nik is an Associate professor in Sociology at Flinders and her area of research interest is human-animal relations, with particular interest in human-animal violence links. Nik will speak about the various projects she has been involved in over the last fifteen years which address this issue. More information on Nik can be found on our Members page. Mary-Rose is a tried-and-true lover of animals. She is currently enrolled in the Master of Social Work (Coursework) at Flinders University. She will talk about her current social work placement with the RSPCA and Anglicare SA, Home Care. The placement’s focus is on the important health and well-being relationship for elders with companion animals in the home. Its focus is on how support care services can be extended to acknowledge, foster and maintain this important relationship. Lisel is a researcher in the School of Social and Policy Studies at Flinders working on child well being, having spent the last three years researching older people’s well being at the University of Adelaide. As per usual, she will be trying to include animals into her new work in some way. More information on Lisel can be found on our Members page. Dian will talk about her PhD research which investigates the impact of natural disasters on people with pets. Australia, New Zealand and the United States all have a similar rate of pet ownership, with around 65% of households living with pet animals. Summarising and comparing a disaster experience from each of these countries provides insights into the similar issues faced by people and their pets and also highlights those issues that are unique to each event. One issue that is commonly experienced by people affected by disaster is the added distress of trying to manage, or being separated from, a loved animal companion at a time that is already fraught with danger and anxiety. More information on Dian can be found on our Members page. Zoei is will talk about her PhD research which focusses on the contributory role of animal shelters to companion animal disposability. She has a particular focus on the human-companion animal relationship and the social creation of petness. More information on Zoei can be found on our Members page.